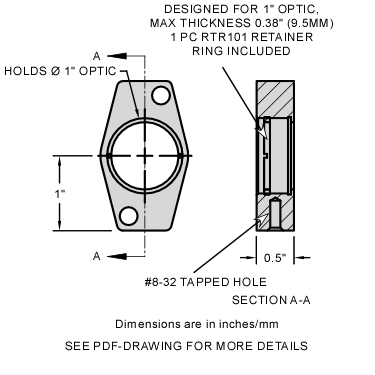 Base Lab Tools fixed optic mount contains a 1.035-40 threading mounting hole to accommodate Ø1 in optics. 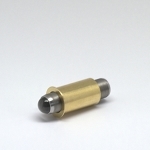 Each FOM010 includes one retaining ring to secure an optic up to 9.5 mm thick. Alternatively the 1.035-40 threading allows for optics that are premounted into a lens tube to be threaded into the mount. The #8-32 mounting hole at the base of the FOM010 makes for easy post mounting. Beyond the mounting features the FOM010 has two Ø6 mm holes to allow the use of two cage construction rods for in setup alignment of the optical axis.